It just dawned on me as I was working on updating my page that I have not blogged about what we have been doing in a while. Not since coming back from Fort Worth. Well, we have been busy. 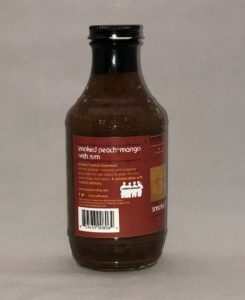 Since coming home, we have been redesigning our labels for both the sauces & rubs to make them cleaner and easier read, also we have new labeling standards we must comply with for the FDA. with that in mind we have been under a complete redesign. And through it all we have been getting out and about to all the Market of Choice Stores around Oregon doing tastings of the sauces they are carrying. We are finishing up out last 2 stores by Fathers Day. We had to cancel on 2 stores when I fell ill and was not able to attend them. While doing a tasting I got to meet a very cool guy that I have had a crush on since my teenage years. 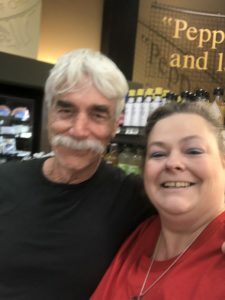 I got to meet Sam Elliot. Who is such a gentleman and a really nice guy. We also are very excited because we have gained a new retail location account. We are going into all 18 Portland Area New Seasons Markets. 6 Portland area stores will be carrying 5 of my rubs and 3 of my sauces. Those stores include: Cedar hills, Nyberg River, Slabtown, Happy Valley, Fishers Landing in Vancouver, and Orenco Statiion in Hillsboro. They will be carrying Honey Habenero BBQ Sauce, Roasted Garlic Sweet Molasses BBQ Sauce, and Tangy Mustard. Along with the line of rubs including cheerin’ chipotle mocha, pumpin’ poultry, sizzlin’ seafood, rockin’ red, and tantalazin’ tex-mex rubs. The remaining stores will carry the 5 rubs Including, Raleigh Hills, Sellwood, Concordia, Seven Corners, Arbor Lodge, Hawthorne, Progress Ridge, Williams, Grant Park, Woodstock, Mountain Park, and University Park. To make sure this happens, we have been working with our design team, label makers, and co=packers to make sure that everything is done. It has been a few sleepless nights, and driving my family bonkers. In the end, we have the Market of Choice rub order complete and will be delivering New Seasons Market order this week. And we have finally released the newest sauce. 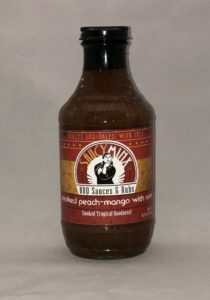 We have collaborated with 4 Spirits Distillery in Corvallis to create our Smoked Peach Mango with Rum BBQ sauce. It features smoked peaches and mangoes, along with Habenero spiced rum. What we love about this distillery besides their rum, is they have a mission to help local veterans. so we will be donating a portion of the proceeds from every bottle to them for their Veterans causes. You can find out more about them on their web site. Just click on their name above. And Finally, We have results from 2 more BBQ sauce contests. This year our Smoked Cherry Chipotle BBQ Sauce finished 5th at American Royal BBQ in the Mild Tomato category. Our Tangy Mustard was also recognized by The National BBQ News in their Sauces of honor contest. We were awarded 9th place in the Chicken category. Thank you everyone for your support, and encouragement. We love what we do and will continue to grow our business.